But that was all before I talked to my mum about my problem. As you’ve read from my previous post, I have accepted my condition and moved on. I now take things as they come with more of an open mind. The diabetic clinic has since started me on Metformin and insulin jabs. It took a short while for me to accept the news, but I remembered reading this mummy’s blog post, and reminded myself that being put on medication and insulin does not make me a failure. Maybe my body just wants to be a special snowflake. Haha. Oh, the wonders of insulin! After I was discharged from hospital, I was still on the higher dosage of medication and insulin for a day. (Just to combat any remnants of steroids still in my body.) We had gone out for lunch and I think I ate a bit too much, but whoa my blood sugar level was surprisingly within range. I know it’s not something to be joyful about as the insulin is not produced by my own body, but isn’t it most amazing just thinking about how insulin helps to break down the sugar? I still try to work in some exercise and walking as I don’t want to be dependant on the medication and insulin. With the lower dosage now, my blood sugar readings can still go a little out of range depending on how much I eat, what I eat and how physically active I am. I was telling my good friends how I’m immuned to needles already. I’m not scared of needles to begin with, but I haven’t been poked so much in my life until now. I think this year is a winner. I’ve drawn so much blood that the nurses keep saying sorry and I’ll just reply that it’s ok. First it was at least five vials for various tests including thalassemia. Then it was two vials for the glucose tolerance test. Then twice for HBA1C. Then another 4-5 vials just before I got discharged from hospital. Not to mention that I have to prick my fingers seven times a day at least twice a week for blood sugar readings. And now I have to inject insulin — one type is a slow release insulin which is injected only in the morning, the other is a rapid release insulin which is injected before each major meal. So that’s four injections in a day. Each pen contains 300 units of insulin. The disposable needle is screwed on at the tip of the pen. The dial on the other end controls how many units of insulin to be injected. The needle looks like this. Does the needle have to be poked all the way in? Yes, but don’t worry, it doesn’t hurt too much because the needle is so fine. Besides, I inject the insulin at my belly and there are lots of fats there. At most, all I feel is a slight prick. Depending on where I inject on my belly, sometimes there isn’t even any blood at all. Little reminders of love. All for you baby, all for you. 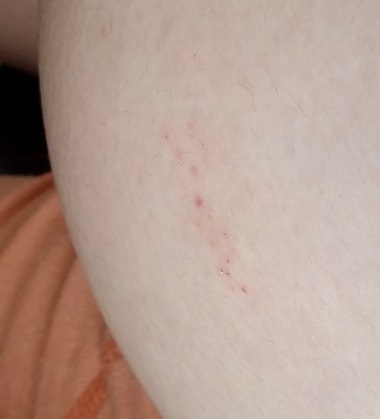 I have been injecting the left side of my belly so much that I’ve left a trail of needle marks. All because I know baby is resting on the right side of my belly. It’s silly to think that the needle would ever poke baby (with all those fats in between) but still, just imagining the needle going in where I know baby is beneath, puts me off. Baby has now shifted position to the left side of my belly. Think I’ll start injecting on the right side of my belly. That kinda evens things out. Lol. You have the same or similar insulin pen? 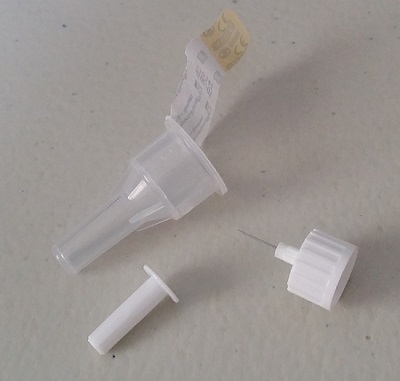 You just screw on the needle, then twist the top of the pen to required number of units to inject. After that, just poke the needle in and press the top of the pen until the clicking stops and you can’t press anymore.